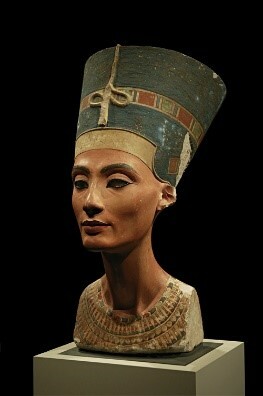 Cosmetic products have been used for thousands of years with the goal of enhancing or altering physical appearance. Although the goal has remained the same, modern cosmetics have become a highly specialized field that utilizes complex chemistry techniques to manufacture a wide range of products. One such example are creams, which are semi-solid emulsions of water and oil. Typically, water and oil are immiscible (i.e. not forming a homogeneous mixture when added together), however through the use of stabilizing agents and emulsifying techniques, homogenous mixtures are attainable. Depending on the major component, creams can be either water-in-oil (W/O), which are small droplets of water dispersed in a continuous oily phase. Or oil-in-water (O/W), which are small droplets of oil dispersed in a continuous water phase. The type of cream being produced will dictate the type and number of stabilizing agents required to form the emulsion. The major factor at play is maintaining the hydrophobic-hydrophilic balance between the two phases. Pickering, or particle stabilized, emulsions are one such type that has been recognized as having a number of interesting properties for cosmetic applications. 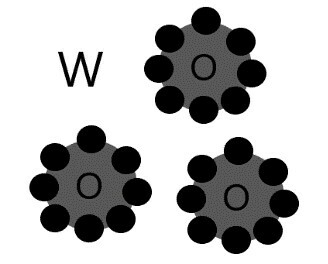 white = water phase (W), gray = oil phase (O) and black = solid particles. When correctly selected, the particles are irreversibly adsorbed at the water-oil interface, which inhibits separation/structural change (also known as Oswald Ripening). Oswald Ripening is a thermodynamically-driven spontaneous process, which means the thermophysical properties of the incorporated compounds will have a major effect on the stability of the cream. These properties will also dictate how the creams reacts to the temperature differential when applied to the skin. Understanding and being able to measure thermal properties, such as thermal conductivity, of the incorporated compounds are therefore crucial to the development of a stable, high-quality cosmetic product. From a user standpoint, creams are applied directly to the surface of the skin; the body’s largest sensory organ. As such the perceived feel of the product is another criterion of vast importance to product development. Similarly to how many athleticwear groups are striving to develop clothing that seamlessly matches the natural feel of the skin, cosmetic products that leave the skin feeling heavy/oily tend to be less popular then those that have a lightweight or cooling sensation. Thermal effusivity is a measurement of a samples ability to exchange heat with its surroundings and is highly representative of the human perception of touch/feel. Thus, having the capability to measure thermal effusivity is a great way to better understand and quantify these effects. 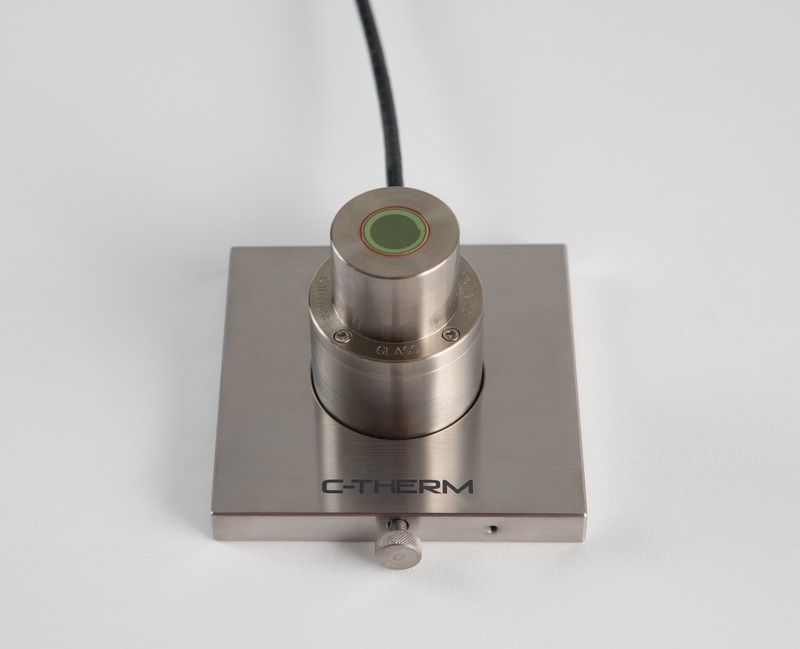 C-Therm’s proprietary Modified Transient Plane Source (MTPS) method offers a one-sided, transient based sensor that simultaneously measures thermal conductivity and effusivity of a wide range of samples. With capabilities to analyze solids, liquids, powders and pastes, the MTPS is the most versatile thermal analysis sensor on the market today. Figure 3. C-Therm’s Modified Transient Plane Source (MTPS) sensor. The ability to measure such a vast array of sample types makes the MTPS an excellent fit for cosmetic companies as a single sensor is capable of measuring not only the final product, but all the various incorporated compounds in their natural form without the need for extensive sample preparation. The fast-paced world of QA/QC and R&D make the MTPS a clear front runner, with sampling times under 3 seconds. Also, the low temperature rise (i.e. <2ºC) ensures a non-destructive test and thus no loss of valuable product during analysis. Below is an in-house analysis of both O/W and W/O based creams, highlighting the reproducibility and precision of the MTPS sensor as well as the major differences between cream types. Figure 4. Thermal conductivity and effusivity results for both O/W and W/O cream emulsions. For testing of these samples, 3 sets of 5 measurements were performed (n=15 total) and the obtained average is represented in the figure above. The O/W sample had the highest measured values of 0.514 W/mK and of 1419 Ws½/m²K for thermal conductivity and effusivity, respectively. The W/O sample had significantly lower measured values of 0.153 W/mK and 487 Ws½/m²K for thermal conductivity and effusivity, respectively. It should be noted that for both samples, the largest RSD obtained was 0.4%, indicating highly reproducible results between measurements. The obtained results highlight the notable differences between the two types of water and oil emulsions indicating the clear differences in note only their thermophysical stabilities, but also the resulting differences in perception when applied to the skin. Comment on "Measuring the Thermal Conductivity and Effusivity of Cosmetic Emulsions"